Giving our kids the best start in life is what we do as parents, and when it comes to designing your children's bedroom, keeping a few useful techniques in mind can make sure their space is ideal for learning and personal development. As the leading UK manufacturer and retailer of children's beds and bedroom furniture, Childrens Bed Centres have almost 25 years’ worth of experience and knowledge when it comes to designing the perfect space for children. Their unique kids beds and furniture offer versatile, colourful designs that both kids and parents love. But beyond that they also understand that practical, yet fun furniture with great storage options can help children reach their potential. Your child's bedroom will be the first real space of their own, so if they’re old enough, it helps to design the space together. The most important part of your child's room will be their bed. After all, a good nights’ sleep can aid learning and put your child in the right mood for the day ahead. Make sure their bed is sturdy and comfortable, and with the selection of cabin beds, kids four poster beds, study beds and more available at Childrens Bed Centres you’re sure to find the ideal one for you. Make sure light from the windows doesn’t keep your child awake by choosing lined or black out curtains and ideally position the bed away from the radiator to ensure they don’t overheat at night. 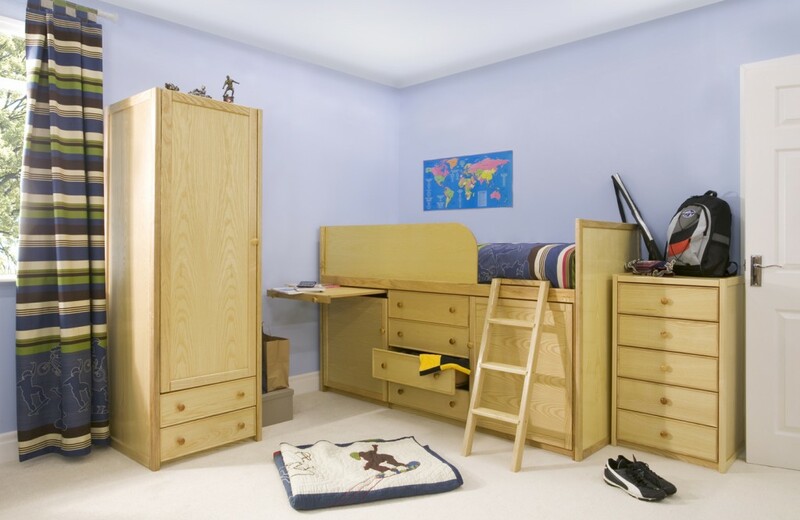 To encourage your child to use their bedroom as a space for learning, make sure the area isn’t cluttered. Messy spaces can be very distracting when they’re trying to concentrate on a task. Having good storage options in their room is the best way to deal with clutter. From childrens wardrobes or chests of drawers that your child can reach, to under bed storage, make sure they know where everything lives and can reach all the drawers themselves. The experts at Childrens Bed Centres encourage you to look at the bedroom through your child's eyes… Are things like books, pens and paper readily available and easily reached? Is there enough space to do the activities they enjoy the most like colouring or laying out track for a train set? For older children is there a suitable desk area to complete schoolwork? With all this in mind, remember it doesn’t all have to be about learning, your child's room also needs to be a fun space where they are eager to spend time. The best bedrooms for kids are ones designed with their needs in mind. Depending on their age, it is a great idea to involve children in decisions regarding the overall look of their bedroom and provide them with an area to learn as well as play and store their belongings. To discover more about the company’s childrens bedroom furniture, visit http://www.childrens-bed-centre.co.uk or call 0844 8007772 / 01244 379747.